Moms like us are always looking for ways to keep our families happy and healthy. Homemade meals, fresh snacks, and lunches packed with love are just the start. If you are a mom on a healthy mission like me, you might prioritize eating organic as well. Organic foods are produced with less pesticides and other toxins and can often have more beneficial nutrients than conventionally grown foods. Personally, I wanted to reduce the amount of toxins my family was consuming for many reasons but doing so without a plan has the potential to break bank! You can absolutley include organic food in your family meal plan without breaking your weekly food budget. I want to share with you some simple ways to do just that. 1. Know the Dirty Dozen and Clean 15. You don't have to buy EVERYTHING organic. If you know which produce is the dirtiest (contains the most pesticides and other toxins), you know which produce to prioritize. The dirtiest produce is a great list to start buying organic. If you know which produce is the cleanest (contains the least amount of pesticides and other toxins), then you know which produce you don't necessarily need to buy organic. If it is a choice between one of the other, your Dirty Dozen list should go organic first. Here is the Clean 15 and Dirty Dozen list to get you started. 2. Shop Your local Farmers' Market. Your local Farmers' Market can be a treasure trove of less expensive organic foods. Without having the expenses of packaging, shipping, and marketing products to different stores over long distances, local markets usually feature area farmers who are just trying to sell their latest harvest, including organic farmers. Most of the time, this is much less expensive than organic foods in your supermarket. Want to find your local Farmers' Markets? Click here. You really can't get less expensive than growing your own! Besides saving money on organics, you get the added satisfaction of cultivating your own food. One of our personal favorite sources of seeds is Seed Saver Exchange. Definitely worth checking out. Instead of selecting recipes and then shopping for all of your ingredients, first see what is on sale. Shop for discounts and sale items first and then get creative with your bounty! This is a great way to save money. I know what you are thinking, healthy, organic foods rarely have coupons in the Sunday paper. However, coupons for organic foods are out there. Companies like Organic Girl, Earthbound Farm, and others will send you coupons upon request! Check them out! Saving money on organic is possible. 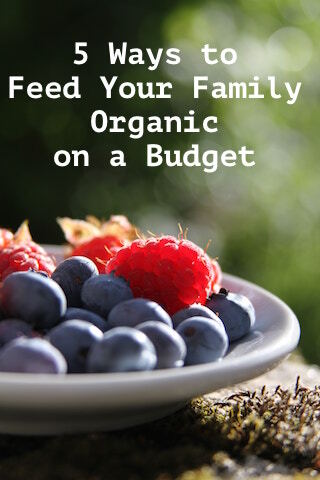 Try these 5 tips will help you feed your family organic on a budget. Which one of these strategies is first on your list to try? Join our email community and I will send you my healthy shopping list as a BONUS! Older PostMoms Together: Why a Mommy Mastermind Could be Everything You Are Looking For!